If you are looking for a holiday in the sun where you can enjoy world-class cuisine, upmarket sophistication blended with timeless traditionalism, within a beautiful secluded bay, gently lapped by the cobalt water of the Mediterranean, then look no further than Llafranc. This pretty fishing village on Spain’s Costa Brava has long attracted the creative and elite. Throughout the 20th century, film stars, writers and artists flocked to Llafranc, including Salvador Dali. Backing on to the town’s sandy bay are attractive low-rise, white-washed buildings and a series of quality restaurants with terraces looking out to the harbour, serving top-notch tapas, tasty meat dishes and fish caught fresh by the fisherman that day. 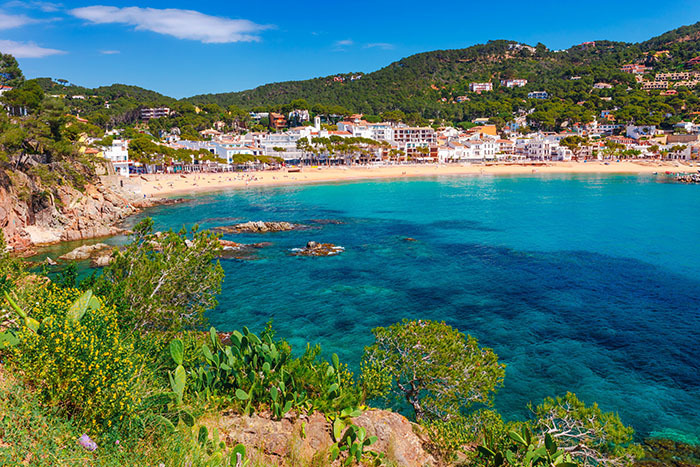 Much of the beauty of this chic yet timeless coastal village is owed to the emerald vista that surrounds Llafranc, where hillsides covered in sweet-smelling pine trees roll towards the water’s edge. A coastal path winds around the shoreline from Llafranc to its neighbouring town of Calella de Palfrugell, an equally upmarket, sophisticated and traditional fishing town, which is bigger than Llafranc and has a wider choice of restaurants and shops. One of Calella de Palafrugell’s most famous landmarks is the beautiful botanical garden perched at Cap Roig on the southern tip of the town. The gardens alongside the neo-Gothic castle in red bricks, were built in 1927 by the Russian expatriate Colonel Nikalai Woevodsky and his aristocratic English wife. This part of the Costa Brava, which is approximately 125km to the north of Barcelona, is an exceptionally pretty, affluent and special corner of Catalonia, where you can enjoy spending leisurely days watching traditional fishing boats moored next to exquisite yachts, bobbing elegantly in the harbour.